This Instant Pot Jambalaya was adapted from an authentic Creole Jambalaya recipe and has spicy andouille sausage, chicken and shrimp combined with rice, is flavored with Cajun spices and cooked to perfection. A delicious one-pot meal that you can make so quickly in the pressure cooker if you have all the ingredients ready. Nawlins. New Or-linz. New Or-leens. No matter how you pronounce it, if you’ve visited New Orleans, you have to agree that it’s one of the most historic and charming cities in the United States. I feel it’s a city that everyone should have a chance to visit. The standout star of New Orleans is the Cajun and Creole cuisine. Cajun and Creole restaurants abound and you can literally eat your way through that city! Some of my favorite dishes include Jambalaya, Etouffee, and Gumbo. Today I want to share this Instant Pot Jambalaya recipe. 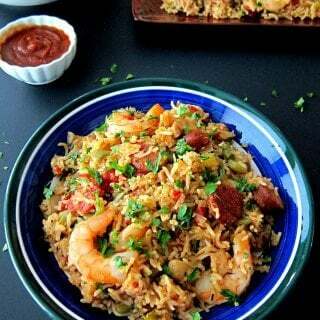 Jambalaya is a hearty one-pot meal made with rice, meat, and seafood, similar to Spanish paella. There are two types of Jambalaya. Creole, which includes tomatoes, and Cajun, which is made without tomatoes. 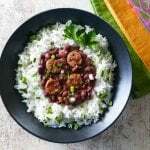 Creole cuisine originated in the city of New Orleans and Cajun food is traditionally associated with the French Acadian people who settled the swamps of southwest Louisiana. My Instant Pot Jambalaya recipe includes tomatoes and is derived from a cookbook I’ve had in my possession forever, but have no idea when or where I got it! 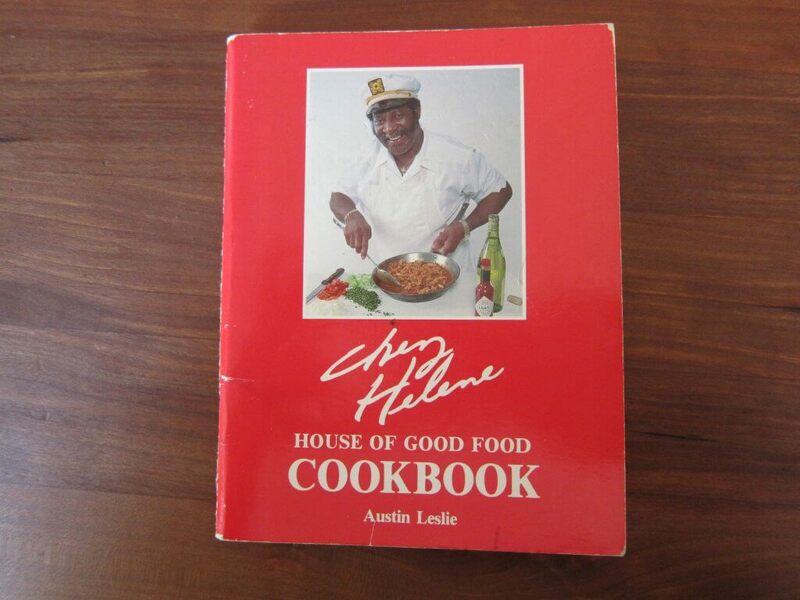 It’s a tiny little cookbook a bit larger than a smartphone, written by chef Austin Leslie of the famed New Orleans restaurant Chez Helene, which closed in the 1990’s. Looking at the ingredient list, you might think it too long and be tempted to skip this recipe, but I hope you won’t! Some recipes are the ‘dump in the pressure cooker’ kind and some take a little more effort. This one is definitely worth the little effort it takes (which is really not much at all.) The primary hands-on work requires sauteing the meats and vegetables individually before adding the rice and liquids. Hope you get to try out this Instant Pot Jambalaya recipe. It’s a meal in one that doesn’t really need any side dish. It’s a great dish to make for a group. You might also be interested in my Instant Pot Gumbo recipe, which is equally delicious! 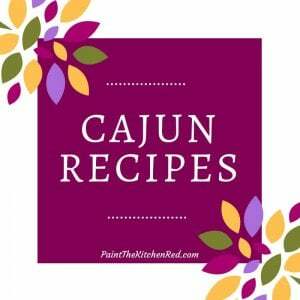 Click Below to Check out all my Cajun Recipes! You can stir in the uncooked shrimp at the end and let it cook in residual heat with the Instant Pot covered, just add a couple of extra minutes. The advantage of adding it in at the end is that the shrimp juices get absorbed into the rice and there’s less of chance that the shrimp is dried out. This is my preferred method. Andouille is a spicy smoked Cajun sausage. If you don’t have access to it, substitute it with a Spanish chorizo or kielbasa. You can substitute Creole seasoning with Cajun seasoning, and you can also add more or less seasoning than I’ve suggested. The quantity of salt you need will depend on the quantity and type of Cajun seasoning you use. Go easy on the salt if you are using more seasoning and/or if your Cajun seasoning is very salty! If you’re new to the Instant Pot and aren’t familiar with how to use it, please read the Instant Pot DUO Beginner’s Quick Start Guide or the Instant Pot ULTRA Beginner’s Quick Start Guide first and then come back here to learn how to make Instant Pot Jambalaya. Rub shrimp with 1 tsp of Creole seasoning and set aside. oil to inner pot of Instant Pot. Press ‘Cancel’ to turn off heat. Add shrimp and stir briefly, for just a few seconds. You are not cooking the shrimp through. It will cook at the end. rice and stir to coat, about 30 seconds. worcestershire sauce, broth and bay leaves. Stir in the reserved sausage and chicken. The display will count down from 7 to 0; it will switch to ‘Keep Warm’ mode and display ‘L0;00’. Close the Instant Pot and allow the shrimp to finish cooking in the residual heat. After 10 minutes, open the Instant Pot and add parsley. Gently stir the jambalaya. Serve with hot sauce on the side. This Instant Pot Jambalaya was adapted from an authentic Creole Jambalaya recipe and has andouille sausage, chicken and shrimp combined with rice, is flavored with Cajun spices and cooked to perfection. Rub shrimp with 1 tsp of Cajun seasoning and set aside. Press 'Saute' and add oil to inner pot of Instant Pot. Add andouille sausage, and cook until browned, about 6 minutes. Remove with a slotted spoon and set aside. Add chicken, and cook until browned, about 5 minutes. Remove with a slotted spoon and set aside. Add shrimp and briefly saute for just a few seconds, adding a teaspoon of oil if required. Remove with a slotted spoon and set aside. Add onions, bell pepper, celery, and garlic. Stir until onion is translucent. The liquid released from the vegetables should be enough to deglaze the pan. If it's not, add a few tablespoons of broth to deglaze. Add thyme, Cajun seasoning, salt, rice and stir to coat, about 30 seconds. Stir in tomatoes, worcestershire, chicken broth and bay leaves. Make sure there's nothing stuck to the bottom of the pan. Cook on 'Manual' or 'Pressure Cook' setting for 7 minutes. Make sure steam release handle is in the ‘Sealing’ position. Do a Quick Release and open the Instant Pot. Close the Instant Pot and allow the shrimp to finish cooking in the residual heat for 10 minutes. Open the Instant Pot and add parsley. Gently stir the jambalaya. Garnish with shallots, if using. ** Quantity of salt will depend on your Cajun seasoning. If it's more salty, go easy on the extra salt. If any of the ingredients being sauted browns too quickly, press 'Cancel' until the Instant Pot cools down a bit and press the 'Saute' button again to restart. Andouille is a spicy smoked Cajun sausage. If you don't have access to it, substitute it with a Spanish chorizo or kielbasa. You can choose to not saute the shrimp at the beginning. Just add it in raw at the end, and the juices will get absorbed by the rice, without the shrimp drying out. What a cool cookbook. I love it when people dig up hidden gems to share. 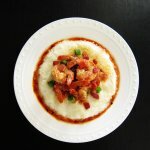 What type of cajun or creole seasoning do you recommend? Omigoodness. This was so authentic tasting! I would recommend freezing the chicken and andouille and then cutting them up. The sausage we used came out more like little meatballs. The Cajun seasoning is one we put together from another website and it was fantastic. We did, however, add some hot sauce once it was on the the table. I would serve this to company. It was fabulous. Awesome, Shari! Thanks for posting your suggestions and modifications. I know right? But that I can’t remember how or where I got it, is scary! I use whatever seasoning I have on hand: Tony Chachere’s, Slap Ya Mama, Emeril, or even Old Bay. 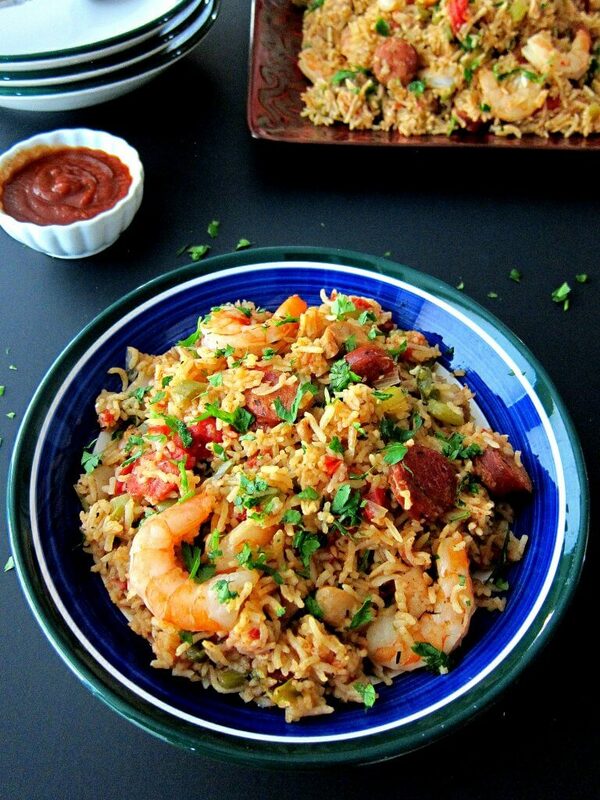 How many will this jambalaya recipe serve? I’m very anxious to try this. Luv ur explicit instructions. Thanks Cheryl! I think the recipe can serve 6 people easily. Hope you get a chance to make it. Enjoy! Hi…I tried this recipe and it was fabulous. I am planning to make it again, but for 10 people. How do you adjust the ingredients and any changes to the IP timing? Hey Amanda – thanks for your question. I feel the original recipe is pretty good for 6 servings – not sure if you agree. In which case you could double the recipe and get plenty of food. If I were doubling, I would just double all the ingredients. Keep the cook time the same. The only thing to watch out for is make sure you’re not going over the 1/2 fill mark on your Instant Pot. And if you wanted to be extra careful, just add the tomatoes and rice on the top, after all the other ingredients have been put in and stirred up and just push down into the liquid without stirring. I haven’t bought an instant pot yet, but can’t wait to make the plunge. It seems like it will make cooking so much quicker, which is great for weeknight meals. 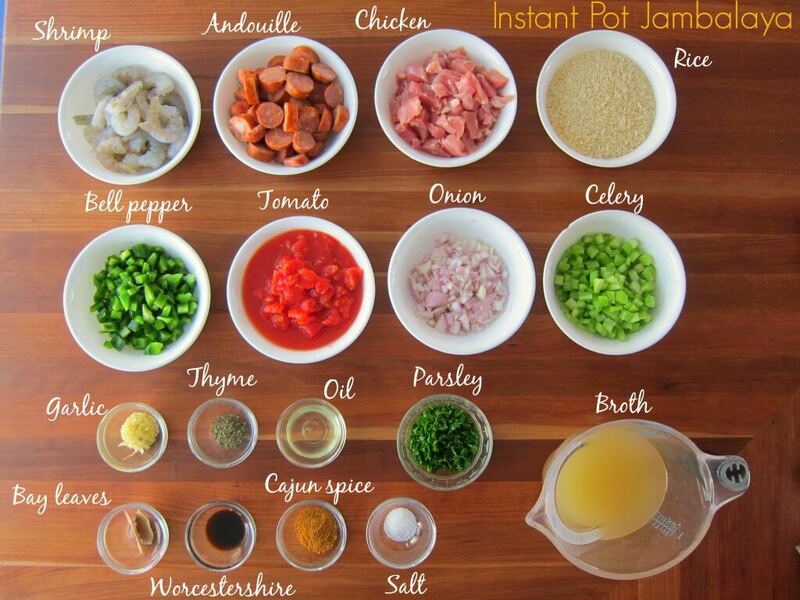 I love to make jambalaya and this seems like a great recipe. I had not idea that the difference between Creole and Cajun jambalaya was the tomatoes! That’s so interesting. Hi Danielle, hope you are able to get your Instant Pot soon! Be aware that the Instant Pot takes time to come to pressure and to release pressure, which adds on to the cook time – so 10 minutes for chicken can take 25 to 30 minutes. But the beauty of it is that the chicken is so tender and flavorful AND you don’t have to watch it, stir it, turn it, etc. You can go about your work and it cooks in the background. That’s the time-saving part for me. When you get your IP, you might want to check out my step by step beginner’s manual. Thanks for your comment! Could I complete steps 1-6 the day before I plan to serve this dish? And then pick up at step 7 the day of? We have an office party and I could bring the instant pot to work but probably can’t get away with sautéing anything. I would be fine cooking under pressure at work though. Hi Brian, the only thing I would worry about would be any bacteria that might be in any meats, since we’re just browning and not completely cooking. If it weren’t for that, you could make it work. Can you cook it completely the day before and heat it up the next day either in the microwave or using the steam function of the Instant Pot (1 cup water + food in a container placed on a trivet.) for less than 5 minutes? Or you precook the meats and add them in at the end the next day (flavor won’t be as good). Don’t forget to leave extra time for the Instant Pot to come to pressure with cold ingredients if you choose to finish cooking the next day. Jambalaya is always better the next day after the flavors meld. Make it, refrigerate and reheat the next day instead. Thanks Joyce! That’s such a great compliment. Yes, I love old cookbooks too. Blogs are great (of course) but a good old-fashioned cookbook is special. Thank you thank you so much for posting this recipe. This is the 3rd recipe we’ve made in our new instapot and we LOVED it. You’re welcome Donna! So glad you enjoyed it. It’s such a hearty one-pot dish. I made this in my instant pot and it was delicious! I used less shrimp (8 pcs) and more chicken (package of 3 chicken thighs- a little less than double the called for amount). It was so good – our favorite dish we’ve made since getting the IP (and we’ve made some good stuff!). Thank you for sharing! Thank you, Leslie! I’m so glad you enjoyed the recipe. Thanks also for letting us know what changes you made and how they turned out. Maybe I completely missed it, but am I supposed to use cooked or uncooked rice? Seven minutes on pressure doesn’t seem long enough to fully cook rice. ??? Help! Hi there! Sorry if it’s not clear, but it is uncooked long grain white rice – I used basmati. Yes, it cooks just fine in 7 minutes in my Instant Pot. Hope it goes well! Did you use boneless skinless chicken thighs or bone in ones ? Do we cut them and what size ? Hi Shantini – yes, boneless skinless cut into small pieces (1 inch). This recipe is awesome!! I didn’t have chicken and upped the amount of shrimp. I will make it again and add okra. Yum! Thanks for sharing! I love shrimp, so that’s not a bad substitution to make! Glad you liked it. Great instant pot recipe- The rice was perfect! Cheryl – I’m so glad you liked it! One pot dishes are so convenient right? I made this last night. It tastes really good, and the rice was cooked but the texture of the dish was a little “wet.” Is it supposed to be like that? Last jambalaya I made, I recall the rice absorbed pretty much all of the liquid. Hi Kay, when I make it, it’s not wet. It could be that your veggies released some extra liquid. Or did you have anything that was previously frozen – that can cause more liquid to be released. I hope you can make some adjustments next time to get it to a better consistency. Thanks for taking time to comment! Made this tonight and it was a HUGE hit. Thanks for much for posting this terrific recipe. I will definitely make this again and everyone wanted a copy of the recipe. Angel, I am so glad to hear you liked the recipe! Thanks for letting us know. I plan to post more Cajun recipes soon. I just got an InstantPot as a birthday gift & am excited to start trying it. This recipe sounds great – I’m hoping to try it out soon & take it to a crawfish boil I was recently invited to. Since the recipe is for 6, would you suggest doubling and making in two batches or if it can be done in one batch, should I change the cooking time? Hi Ishween – congrats on your new Instant Pot! I would definitely try it in two batches especially if you’re doing it for the first time to take somewhere. That way you can adjust the recipe if necessary. Good luck and please do let me know how it goes if you get the chance. Unfortunately 12 mins didn’t do it so back to the stovetop simmering method, lol! For future attempts, curious if I cooked for 22 mins so the brown rice cooks through, whether that would overcook the other ingredients & therefore ruin the recipe…any thoughts? That’s the hard thing with brown rice, right? I would try it out with larger pieces of chicken thighs. Your veggies might be overcooked, but I think it will taste good – let me know how it turns out, Ishween! Your Jambalaya recipe was great as your chicken curry!! Best Jambalaya I ever made. So delicious!! What kind of rice did you use? I have cooked long grain white rice in the IP and it has taken at least 12 minutes under pressure to get it done. 7 minutes seems much too short of a time. Otherwise, I’d love to try your recipe. I use white long grain or basmati and the 7 minutes is perfect. Keep in mind that the shrimp steams for 10 minutes too. However if you’ve not been able to successfully cook rice for shorter than 12 minutes, you can stick to your timings. OR you can cook for 7 minutes and then close it and cook for longer as needed. Let me know how it goes. Thanks for reaching out. This recipe looks great and I want to try it, but I don’t have an instant pot! Do you think this would work in a crockpot or could be modified for it? Hi Nicole, I’ve never cooked this or any rice dish in a slow cooker, so I’m not sure how the rice would turn out. You can cook it on the stovetop. Follow directions up to the pressure cooking part. Add equal parts rice and broth. Add shrimp at the same time as rice (uncooked). Cook covered on low for 30 minutes or more. If rice is not cooked, add 1/4 cup more water and cook further. Some people cook rice separately and add to the jambalaya. That way you know the rice will be perfectly cooked. Good luck! p.s. you need to get an Instant Pot ? Hi, I was hoping to make this but I’m allergic to shrimp. How can I make this and omit shrimp? Thanks so much I look forward to trying your recipe! Hi Klaudia – I’ve had readers who’ve made it with scallops. They season and saute scallops and set aside, and add them in at the end, fully cooked. I think you could easily omit the shrimp and if you desire, add more chicken or sausage, or substitute ham. Hi this looks great! I am going to try and make it tonite but I dont see in which step you added the rice. Could you clarify? Thanks!! Hi Kim – It’s in step 7 of the recipe card and in the 4th step-by-step photograph. (Add thyme, Cajun seasoning, salt, rice and stir to coat, about 30 seconds.) Hope you enjoy it! Made this today: Fast and flavorful, turned out perfect. I have been using a slow-cooker jambalaya recipe for a few years, but now that I have an Insta Pot I wanted to switch. This was on point and will replace my slow-cooker recipe to be in my regular rotation. Thank you! Hi Beatrice – thanks for your comment! I hardly use my slow cooker anymore. And I don’t use the slow cooker function on the Instant Pot either. For the most part, every slow cooker recipe can be pressure cooked. So much faster and no need to clean multiple pots either. Check out the gumbo recipe I just posted, you might like that one too. This sounds awesome, however I don’t eat rice. I know crazy right? So without rice would I adjust the cooking time? If so to what? Hi Deena! If you kept all the ingredients (and size of cut) the same, you can cook for about 4 minutes on high pressure. You might want to reduce the broth quantity if you don’t want it to be too soupy. Maybe serve with cauliflower rice? Thanks for your comment. I want to first state that you really know how to write a recipe. Very refreshing. So much so, that I will make this shortly for a bunch (12) of golf guys on a trip to the Outer Banks. My only question is, was the andouille already cooked? I have the option of both. Hi Jim – thanks so much for the very kind words. I do use cooked andouille but I think you will be fine with either, since you’re sauteing small pieces. A word of advice – if you’re making a large quantity, you might need to do it in two batches since you don’t want to go over the 1/2 mark for rice. Not sure what size Instant Pot you have. Enjoy your trip – great place to visit! Hi there! This looks delicious! If I omit the shrimp, do I still need to let the pot sit for 10 mins after the quick release? Very flavorful and tasty recipe! Thank you! I am surpised mine turned out as well as it did because my pot didn’t come to pressure! My rice stuck/burnt to the bottom. I stirred and scraped the bottom to free up the rice, then tried again for 2 more minutes (didn’t add anything since there was still liquid). Still didn’t come to pressure, but rice was cooked, it was just a wet jambalaya. So it essentially simmer for 20-30 minutes. Tasted delicious and my husband loved it. Any thoughts on how to keep the rice from sticking to the bottom? Do you always stir, or perhaps I could layer and keep the rice and tomatoes higher in the pot to prevent them from sticking. Do you rinse your rice? Hey Amy, I’m sorry the rice stuck but glad you ended up salvaging it! I’ve never had my rice stick to the bottom when I make this jambalaya. Could it be that you didn’t deglaze enough? It’s important that the bottom of the pot is clear of stuck meat or food before you begin cooking. To answer your questions: I don’t rinse my rice for this recipe (but do rinse when I make plain rice). I do stir everything together before pressure cooking. Hope you give it a try again with better luck. Thanks for commenting! To be honest, there was a lot of liquid in the bottom after sauteing, so the only declaring needed was after the sausage, and the chicken juices took carr of that. Do you saute on high or medium? I started with medium for the sausage, but bumped it up to high at the end of the chicken, maybe that had things too hot. I’ll definitely give it another try…its so good. Eating leftovers for lunch, as we speak. Amy, if you deglazed and you had plenty of water, then I feel your IP didn’t reach pressure because of how your sealing ring was sitting? Maybe just a one-off? I usually use medium for saute setting. Have you seen my post about the IP not sealing? Keep in touch! Interestingly enough, I ran into the same issue where the IP didn’t come to pressure. Strange. This is the first time after making several dishes in IP that this has happened. I checked the sealing ring and don’t see any issue. When I make this on the stove top, I always start with a roux (and yes, it takes forever and a day). Is there a way to do it in the instant pot? I’d love to try this recipe, but I really love the roux, too. Is there a way to do this? Hi Ginna – so I do use a roux for my Gumbo recipe. And I have no problem with doing that as long as I add enough water as described in the recipe. My concern about using a roux for the jambalaya is that you’re also adding in rice and that is starchy and will also absorb most of the liquid which might cause your roux to scorch on the bottom. If you add extra water, you’ll have a wet jambalaya which may not be ideal! My only other suggestion would be use the gumbo technique and make the jambalaya and rice separately and then mix together at the end? I just found your blog this evening and now it’s the middle of the night and I’m still reading recipes and drooling over your Jambalaya and New Orleans Gumbo. Holy Cow! Do they ever look good!!! I’m as happy as the next cook to have one-pot, easy meals, but there’s also days that call for the kind of dinner that uses lots of ingredients and plenty of work. There is something truly wonderful about sitting down for dinner with people you love and offering them the fruits of your labor. I hope you don’t think I’m being sacrilegious if I say that it comes close to being a family sacrament. My husband and I discovered that we enjoy cooking together and I’m pretty sure, southern boy that he is, that he’ll be very excited to try this! Our sons will be equally happy to come over and help us eat it. LOL! Thank you for sharing your recipes and the lovely write ups that go along with them. I’m looking forward to trying many of them out and enjoying your blog! Becky, thank you for the kind words! I am so glad you’ve found me and I hope you get a chance to try out the recipes. You’re right – cooking a meal for the family and eating together is a very special thing. Sounds like you’ve got your priorities in the right place! Yes, please do let me know how it goes. Enjoy! My husband was very skeptical when I brought in yet another appliance…So I am out to prove its versatility in making quality, tasty meals. Many thanks for the tutorials and recipes. Hi Connie, I haven’t tried this so I can’t guarantee that you won’t have some extra liquid, but I would go through all steps except: omit rice and replace 2 cups broth with 1/2 cup broth, cook for 4 minutes, release pressure, open, stir in shrimp and cooked rice, close the Instant Pot and let shrimp finish cooking and let rice absorb some of the liquid. However, I recommend that your first dish (to prove the IP to your hubby 🙂 ) be an exact recipe, since the Instant Pot can require some precision. Could I use chicken breast instead of chicken thighs? I can’t wait to make this dish! Yes, Caroline, you sure can – hope you enjoy it! I made this tonight, but i only had jasmine rice. Rice turned out mushy. Husband doesn’t like mushy food, but he stull went for seconds, so i guess thats a good sign. Lol. I think the liquid i had was more than your pictures because of the canned tomatoes, which probably vary in their liquid-to-tomato ratio. Next time i would use fresh tomatoes. Also, after using the instant pot a few time now, instant pot invariably does not mean instant prepare. Took me forever to peel and devein 40 shrimp. Hi Brenda, Jasmine rice does quick faster than other rice like Basmati. So if you were to do it again, you’ll want to decrease cooking time by 2 minutes. 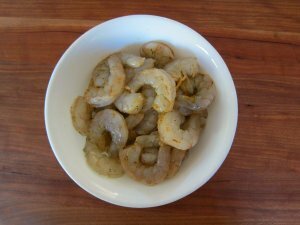 Yes, the Instant Pot is not Instant 🙂 I buy the deveined shrimp – too much work otherwise! But isn’t it great to not have to watch over the pot on the stove? That’s the biggest benefit, for me at least. Good point about the tomatoes – never thought of that! Thanks for checking in. Hi Carla – thank you! Hi Joyce – thanks for letting me know; your comment is much-appreciated 🙂 ! Just made this recipe and it came out perfect. If I wanted to add scallops when would be the best time to add them ? Also, if I added the scallops I would remove the chicken. Would I need to make any adjustments to the recipe? Thank you for this wonderful dish! Unfortunately this was my first Instant Pot fail…..sort of. It turned out alright in the end. My pot would not come up to pressure. I made certain there was nothing stuck to the bottom of the pot before sealing it up. I think there was just not enough liquid for this recipe. For the first time ever, my pot starting counting down the time without being at pressure. I opened it up, stirred it up and closed it again. Again, it would not come to pressure. So, I tasted the rice. It seemed 90% done so I stirred in the shrimp, put the lid on and set the timer for 10 minutes. Everything was done, the rice and shrimp were perfect and the spice was spot on. We loved it! However, I think next time I’ll just follow the recipe to adding the rice and liquid, put it all in a large covered casserole dish and bake for 25-30 minutes. Also, it took far more than 15 minutes to prep this recipe and I’m very efficient in the kitchen. This struck me as one of those recipes where each step would go quickly so I chopped, diced and measured everything in preparation. I would guess I spent more like 45 minutes prepping everything and sauteeing the sausage and chicken and veggies. Still, worth it though to get this authentic flavor. We loved it! Just beware that your pot may not come to pressure unless you add more liquid. Hubby grew up in New Orleans and totally approved this recipe. Hi Janet – I’m glad you liked the flavor, but sorry you had trouble with sealing for the first time! I just made this a couple of weeks ago for my family following the exact recipe. Since you said the pot was deglazed, I agree with you that you probably didn’t have enough liquid. It’s really hard to troubleshoot individual cases because there can be so many variables e.g. the type of rice (I generally use basmati), if part of liquid was used to deglaze the pot and hence evaporated, if any of the ingredients were substituted or maybe reduced in quantity (e.g. since vegetables release some liquid). Feel free to either respond here or through my contact page if you want to troubleshoot further. I’d love it if you were to have success with this recipe in the IP 🙂 Regarding the prep time, please see my about page on how I calculate prep time for the sake of consistency (i.e. the ingredient list determines the prep time) Thank you for taking the time to comment in detail, and I’m especially glad a Louisianan liked it! Just curious, Howe would you adjust time if I used parboiledlong grain rice? Barb, I’ve never used parboiled rice in the Instant Pot so I can’t say for sure, but I’ve heard from people that they cook parboiled rice on the ‘Rice’ setting (which is LOW pressure) for 10 minutes. If you try it out, do let me know how it works out for you. for the tomatoes with liquid, do i pour the liquid in the pot too or do i strain? thanks! Hi David – thanks for your question; yes, you’ll pour in the liquid too. I tried this recipe last night and had the same problem some of the previous comments mentioned… it burned on the bottom of the pot and didn’t cook. I always try to read the comments before trying a new recipe, and I have had this same problem a couple of times before on other recipes, so I was careful to check the seal and to deglaze the bottom of the pot before I started the pressure cooking faze. I watched the pot while it was trying to pressurize and the vent never sealed before starting the countdown. After 7 minutes I did a “Quick Release”, and of course there was no pressure to release. The bottom of the pot was burned, so I scraped it clean with a wooden spoon again, then added another cup of broth and tried it again… same result. I finally finished it on the stove… very good, even though the rice was a little too wet. I checked other Instant Pot Jambalaya recipes and found one where the author of the recipe said he had the same problem until he remembered from prior recipes that rice absorbs water very fast, so he dropped the rice to from 1.5 cups to 1 cup, deglazed with 1 cup white wine then added 2 cups of broth before starting the “Manual” phase and it came out fine I’m going to try this recipe again in a couple of weeks because it was so good, but this time I’m going to sautee the ingredients in a pan on the stove and add more liquid to the pot… I’m thinking that the pot was so hot from the sautee phase that it caused the rice to absorb all the liquid so it burned the rice on the bottom before it could pressurize? Hi Mike – thanks for such a detailed comment! I’ve been trying to ask other commenters what type of Instant Pot they have when they post this problem, but have had a hard time hearing back from them! It’s a fairly new problem that’s come up recently. I think it has something to do with the model of Instant Pot, maybe? I make this recipe often and I know many who’ve made it with no problem. I’m a bit stumped as to why some people have issues. It’s a shame that you’d have to saute on the stove. – did you rinse the rice? – what type of rice did you use? – did you add the tomato with liquid? – What model do you have – by chance an 8 quart? Didn’t rinse the rice; used long grain white rice; added the liquid with the tomatoes; can’t find anything on the Instant Pot that says what size it is (gift from one of my daughters a couple of years ago), but it takes 16 cups (4 qts) to get to the “Max” full mark (unless my measuring cup is wrong–the marks for cups on the inside of the Instant Pot doesn’t agree with my measuring cup!). I do know that the chicken and rice recipe I use calls for 3 cups of broth for 1.5 cups of rice, and it comes out fine–the more I thought about it though, with the bottom of the pot so hot from the sautee phase, it would make sense that because rice absorbs water so fast when you introduce heat that it might cause it to burn on the bottom before it can pressurize. Maybe with a bigger pot the ingredients are more spread out, allowing the broth to penetrate to the bottom faster. I do know that the pot was so full (not to the “Max” mark, but about ¾ full) that the liquid seemed to be absorbing as I put it in. So you know, I did everything according to the recipe, including weighing the chicken and sausage on a scale—I don’t think it’s fair to the author of a recipe to tweak the recipe and then rate it, so I always try to do it according to the original recipe the first time, then tweak it to my own preferences later. I don’t know—strange that it came out perfect for so many and not for others… but it was really good anyway! You could, in addition, rinse the rice and increase your liquid by 1/4 cup if you don’t want to take any chances! Also, it sounds like you have the 6 quart which is what I use for this recipe. And the Instant Pot cup measurement is for the Asian rice measurements which are different. Thanks again for taking the time to comment and I’d love to hear back if you end up making it again. Thanks for the swift advice (and for the info about the cup marks on the inside of the pot–I’ve been scratching my head trying to figure out why my measuring cups don’t equal the ones in the pot)…I’ll try your suggestions when I try the recipe again in a couple of weeks… I’ll let you know how it comes out. 3/5/18: Well, I got an 8 qt Instant Pot as a birthday present. This is the first recipe I’ve made in it and I was anxious to see if making the changes you suggested would eliminate the burn factor. I decided to do the browning and sautéing in my cast iron skillet so the Instant Pot would be cool when I put the rice in, and I added a little more chicken broth. Came out great… delicious! The only problem I had with your suggestions was the 8 qt is so large that if you don’t stir the rice in it’s sitting high & dry—so I had to stir it—but it didn’t matter because it came out fine. I really don’t get too hung up about doing it all in “one pot”… if you sauté it in the skillet you don’t have to wait for the Instant Pot to cool down—but I understand that you have a lot of readers out there who want to do it all in one pot. After the experience I had back in January with my 5 qt Instant Pot, I figured the problem was either the Instant Pot was too hot when I put in the rice, or it burned on the bottom and didn’t cook on the top because it was so full in the little 5 qt pot, or there wasn’t enough liquid. So, I decided if I sautéed everything in the skillet and it still burned, then that would eliminate the “hot pot’ theory. Also, I added a little more broth this time and it came out a little wetter than I would have preferred (which settled the question in my mind of whether it burned last time because there wasn’t enough liquid), so I think next time I’ll go with the original recipe recommended amount of liquid. It sure was good…everyone loved it and the leftovers were just as good if not better… great recipe! Great – that was my experience as well. I’ve been testing out the recipe in new models and I found that letting it cool down made a huge difference. I’ll be posting a blog post in the next couple of days about the burn. My Instant Pot will be here Wednesday and I am so excited! Your jambalaya recipe looks amazing and I can’t wait to make it. If I wanted to make this without the tomatoes, should I add extra broth? If so, how much? Thank you! Hi Katie – I think you might be fine without the extra broth, but you can add maybe 2 extra tablespoons if you wanted to be safe. Good luck! I did a Google search to find a jambalaya recipe for our Instant Pot and chose this one. SO glad I did. It is spot on and fabulous. A definite “keeper” in our kitchen! Hi Dee – thank you for your kind words. I’m happy to help! Just made this tonight and it is so good! Glad i found your recipe! Thank you for sharing!! Thanks for commenting, Tiffani. I’m really happy you liked it! Tried your recipe, loved the flavor. I have an 8 qt. Folowed the directions but got the burnt message on the pot. I Saute on high setting, followed your instructions for shutting off pot if it was sticking. I did stir in tomatoes and rice, maybe that was my mistake. Added more tomatoes and broth, no change still got the burn indicator came on again. Rice did get done, stured in the shrimp , dish was delish. Will try again! Hi Perry – it’s funny you should mention it, but I just borrowed a friend’s 8 quart and made the recipe yesterday to test it out. It came to pressure just fine, with no burn message. The only thing I did differently was I turned the Instant Pot off after sauteing and deglazing, and let it cool down for 5 minutes or so, then continued cooking. I did saute on Medium. I’m glad you liked it, and hope you avoid the burn next time. Thanks for commenting. Made this last night, It was delicious! Great recipe which I will definitely make again! Instructions were easy to follow and very detailed. Will be looking at your other postings for sure! Hi Marianne, thank you – I’m glad you liked it! 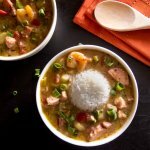 You might like the Instant Pot Gumbo as well – it’s been quite popular. I have creole seasoning in the house. Is this the same as cajun? If not, will it make a significant difference in the flavor? I’m excited to try your recipe! Hi Leila – thanks for your question. Yes, you can substitute creole seasoning for the cajun seasoning. Hope you enjoy it. Just made this recipe earlier today for dinner tonight and WOW it is so good and it was so darn easy. I had never used an Instant Pot and just borrowed my neighbors to see if I like it. Wonderful, thanks. Hi! This was amazing, but I got the burn alert twice. Any suggestions because I want to make it again. I used the 8qt instant pot. Thanks!!! Hi Nichole, if you look above the recipe card, I’ve posted some suggestions on how to avoid a burn error especially with the new 8 quart Instant Pots. Hope they help you out. Forgive the all-capital letters for a moment, but THANK YOU for including PICTURES. I am an Instant-Pot newbie, and am also a little bit of a Luddite – I wasn’t even going to get one, since I am basically a single diner and like to do things old-school on the stove on the weekend and then just eat my way through the leftovers. I even have a personal jambalaya recipe that I’ve perfected. But a friend gave me a 3-quart size instant pot for my birthday with the note “I hear it does everything but chill your wine for you” so I need to break it in. But new and unfamiliar technology scares me a little. You have pictures. It’s jambalaya. I know what jambalaya is supposed to taste like. And you have pictures that show me what button to push when. *breathes* I can do this. Hi, this looks like a great recipe! How would you change the recipe to use brown rice instead? Would just adding cooking time dry out the chicken and sausage? Hi Nathan – although you’d think the other ingredients would overcook, I’ve had readers make the recipe with brown rice for 22 minutes and they say it’s turned out great. Hope you like it! Wow! Just made this! Delicious! Awesome – Thanks for letting me know, Terra-Lynn! This is only my second Instant Pot recipe and it turned out perfectly — both the consistency and the flavor. I omitted the shrimp so I let the pressure naturally release for 10 minutes as you recommended in the comments and it worked out wonderfully. Will definitely make this again!! Awesome! I love this recipe too – so satisfying. Thank you for taking the time to comment!